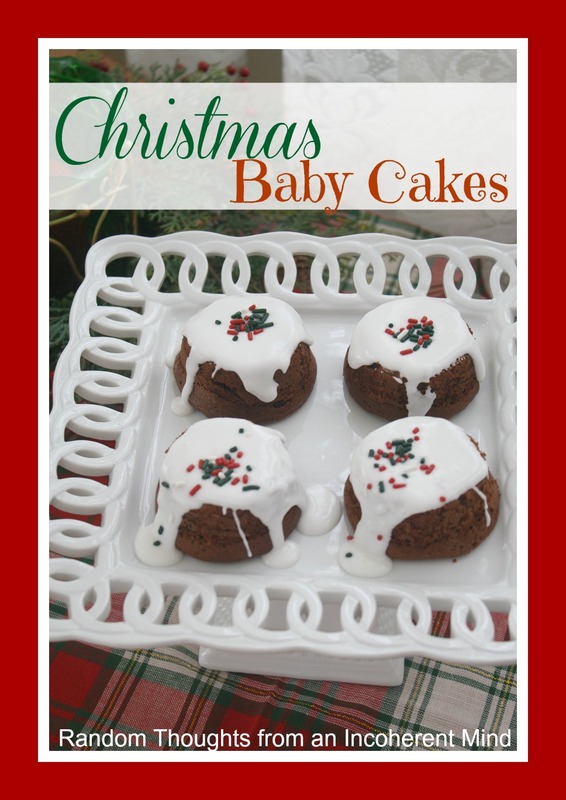 I was wishing for a little something sweet this past weekend and decided to make some Christmas inspired Baby Cakes. You wouldn't believe how simple they are to make. Preheat oven to 350°. Beat first 6 ingredients at low speed with an electric mixer just until dry ingredients are moistened. Increase speed to medium, and beat 1 to 2 minutes or until smooth, stopping to scrap bowl as needed. Spoon batter into 2 greased and floured (12 cup) muffin pans. Arrange cakes upside down on a serving platter. Spoon Winter White Glaze (recipe below) over cakes over (about 1 tablespoon per cake) spreading with a spatula to thoroughly cover cakes. Garnish, if desired. Beat together all ingredients with an electric mixer. Use immediately. Got to go to watch the Christmas tree lighting in Rockefeller Center now. Gina, these are so cute! I bet they taste great, as well. I'm adding this to my files. I think my kids would love these! I think I would love them too! Thanks a lot Gina, now you having me craving something sweet LOL!! They look GOOD! These look so good Gina! Wish I was there to eat one! 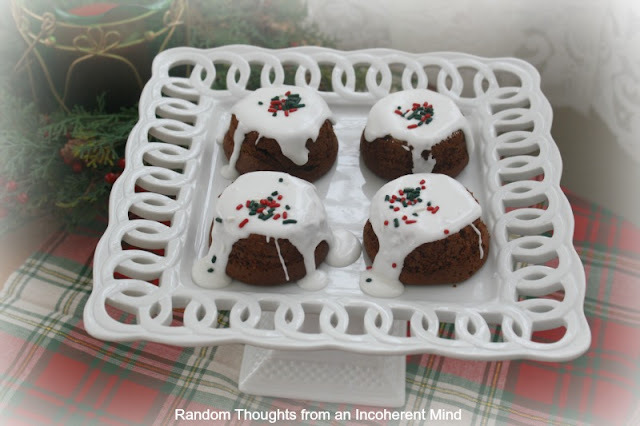 Mmmmmm these look so good, Gina, and so pretty on your white cake stand. These are adorable! and so easy to make. I'm going to be giving these a try. Thanks so much for the recipe. Oh, yum!!! Will have to try these!! Gina.. these are so pretty! I am going to make them soon... it just sounds to easy! Have a happy day. Gina, these are so so pretty... and easy!!! Your pictures belong in a magazine! They are adorable Gina and they look yummy!! Yummy and they are so easy to make. My left thigh said "Bliss, you've been doing so good not over indulging". My Right thigh said to helll with the left thigh. 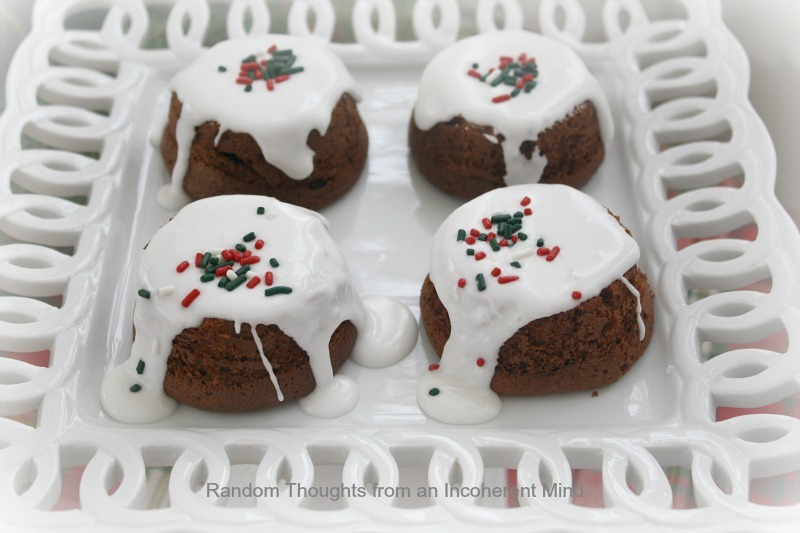 These look yummy, I think I could handle making these and I always love anything chocolate. Gina, these are just beautiful! I love your photography as well and that beautiful plate. This is perfect for holiday parties - just a little bite of everything. Yum!! They sure look good and they're as cute as can be as well. Omygosh...these are so pretty and festive and I KNOW they taste like a million dollars. ummmm.. I could handle one of these about now! Gina, The look so good and they are so festive. Bob loves devil food cake, there must be a connection. LOL! I just may need to try these. Love the cake plate. Gina Yum!! They look so pretty as well! Easy for company over the holidays! 2012 Artists Series and Giveaway from The House of Edward! Yummy, yum, yum. It is finally cool enough here to bake..can't wait to give the recipe a try. Thanks for sharing. Sending you warm hug my friend. Gina these are really cute and festive for the holidays. Thanks for sharing the recipe. mmmmmmmmmmmmmmmmmmmmm..these are fantastic. I may have to try these for our bunco Christmas party. They are cute, sound easy, and look delicious! Does it get any better than that? Thanks for sharing, they look yummy and I think I think I could actually get these done. How did I missed this post????? You know I have a big sweet tooth! LOL They look so wonderful!!! Great recipe. You know I will have to try this one! These baby cakes are so cute! This sounds delicious and easy and fun! Just right for a person who only makes chocolate chip cookies from the pull-apart section of the grocery store! Thanks for linking up!